Recently, Gina and the Big Dog went on a mussel-eating binge. 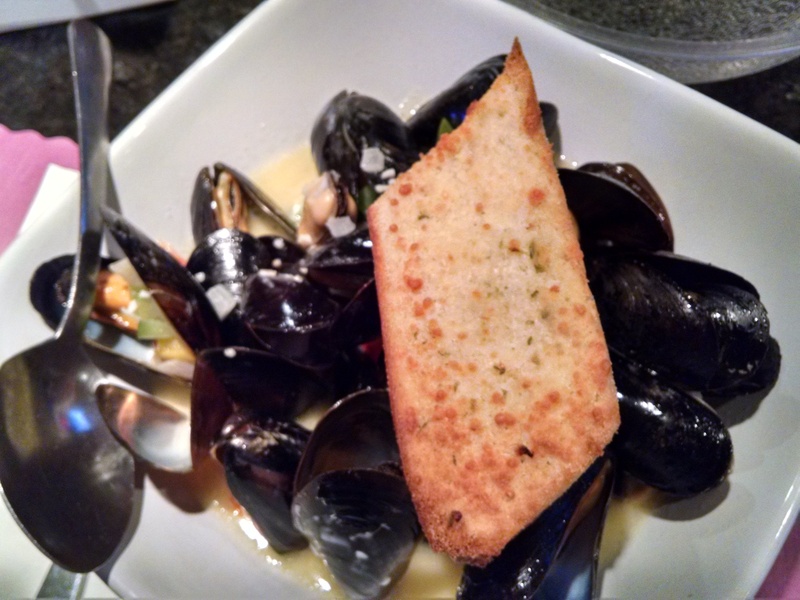 In two weeks or so, we ordered mussel appetizers off five different menus in the northeastern corner of Buzzards Bay and came away with the conclusion that there’s something for everyone here. We were surprised by the diversity. The basic strategy, we believe, is to saute fresh and clean mussels, typically from Prince Edward Island, in a tasty sauce just to the point of doneness. Add some bread for dipping in the sauce and you’ve got a hearty and simple appetizer. Each of our local restaurants interpreted all of that differently. Our first stop was at Mezza Luna in the village of Buzzards Bay. This institution is a favorite destination of ours when we are looking for consistent, good food in a comfortable yet white-tablecloth atmosphere. The bar is typically packed with people who make for interesting eavesdropping, but on this Tuesday evening, it was unexpectedly quiet. The mussels appetizer ($13) inspired our little journey with four parenthetical, challenging words on the menu: “We’re famous for them.” So we chose the standard preparation, which the menu describes as being “in our delicious garlic and wine parmesan cream sauce.” Mussels are also available with marinara or fra diavlo sauce. The generous bowl of fresh mussels arrived topped with slivers of garlic and a delicious, creamy, cheesy sauce. This was hands-down Gina’s favorite dish of the odyssey, as much for its careful presentation as its flavor. The bread for dipping was served on the side. The dish came topped with a bowl for shells. The sauce was delicious and the mussels were fresh. Heading west (on a different day), we stopped at Lindsey’s Family Restaurant in East Wareham, where “Mussels Sambuca” were available as a special ($14.99). Now, we know that the folks at Lindsey’s are extremely smart and very responsive to their clientele, and this dish is offered as a special relatively frequently, so it must be popular. But the combination of flavors seemed odd to us. Sambuca liqueur laced a creamy sauce, served with a hunk of garlic bread on top. We agreed that the shellfish, also described as hailing from PEI, at Lindsey’s, was the best prepared of the four mussel dishes we enjoyed. They were clean and fresh and cooked just to the point of doneness. A bit farther down Route 6/28 is Bailey’s Surf & Turf, another favorite spot where the Big Dog found his preferred mussels dish. This scampi version, offered as a special that day ($11.95), was the classic preparation that many think of as the way to prepare mussels. A little white wine, a lot of butter, a healthy toss of fresh garlic, maybe some parsley, and you’ve got yourself a classic. Given the odd adornments we saw during our journey, the simplicity here was welcome. And the oddest were yet to come. Venturing to the region’s other end of Route 6, we went to Brew Fish in Marion, another favorite spot with a nice bar and good wine and beer selection. We like the food there. We saw the word “mussels” ($11) and ordered. Had we continued reading the description, we would have gotten to “fennel.” One thing we agree on is that we don’t like fennel. If you like fennel more than you like shellfish, you would love this dish. If you like fennel at all, you might like this — it’s unusual and creative. The bread served with the mussels was the best of our tour. The bread has to hold its own in the sauce, and can’t arrive soaking in it. The Bistro serves a delicious grilled sourdough with many of their dishes, and it really shines in this one. The one complaint we had at every stop but the Mezza Luna was that our mussels were not served with a bowl for shells. At a couple of restaurants we didn’t even get side plates. 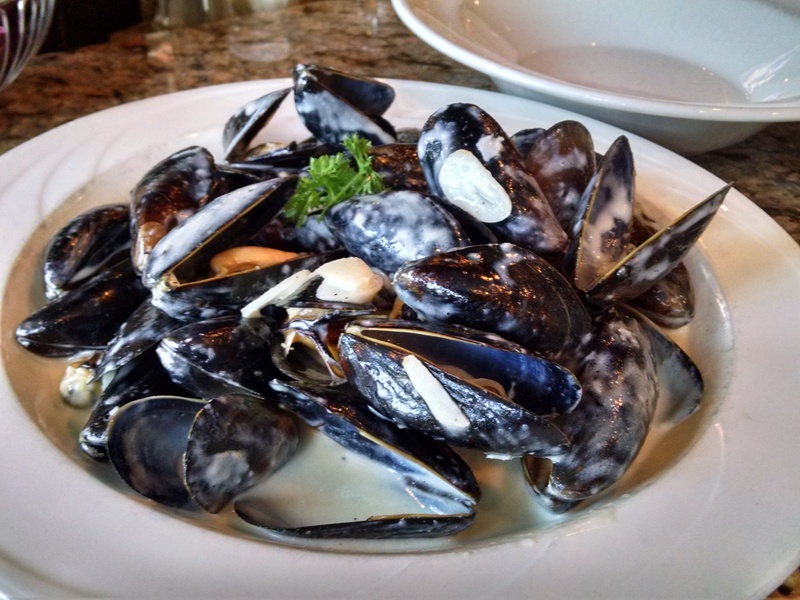 We assumed that steamed mussels would be served just like steamed clams. Maybe other folks have a different approach to eating steamed mussels, but we can’t imagine steamers coming without a shell bowl and side plates. Maybe we should find out, in our next odyssey. This entry was posted on July 24, 2015, 7:51 am and is filed under Roundup, Seafood Restaurants. You can follow any responses to this entry through RSS 2.0. You can leave a response, or trackback from your own site.